The jeep is fantastic! I just love seeing the gallery even though I'm done touring! doo_leroux - great job on your satin stitching. fenifer - your towel looks great I bet you just love it. aada - what a neat idea. millik - the flowers are quite lovely. I do like the leaves. sew~amy - fun I think I can just hear the music. I do wonder how they have the breath to play since they are skeletons. j_q_adams - I like the jeep. 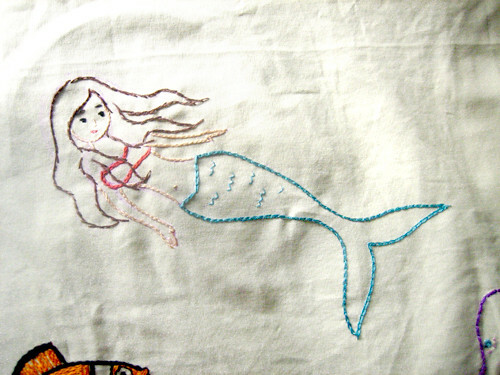 I finished my design on IamSusie's towel. I got it off of HoopLove. You are so welcome JQadams- Thanks for all the inspiring work! I FINALLY finished Fiberartsy's tea towel. I had a little issue with finding the right thing to stitch- At first I picked out a large drooling crazy dog design which is a original of my brothers, because of all the crazy cats and fish and bird action, but my husband told me that I shouldn't be the crazy lady who stuck the rabid dog on her towel, so had to start all over- thank goodness I have washable transfer paper, and my design lines came right out, with little effort! SO, I searched, and thought, and finally came up with two designs ( I'm not sure why I like to do two- I guess it tells a story?) SO~ The buffed up fish is an original design from one of the sets of tattoo flash my brother Ronnie has drawn up(who also happens to be the guest artist for Nov on Urban Threads!) , and the boxing kitty is from Hoop Love on flickr, and since fiberartsy's theme was no theme, and it ended up with a lot of cats and a fish and some birds, I thought that the cats won, but not with out a fight! LOL I hope she likes it! awesome designs, sarahj and greenlightgo! i love the story behind the brawling fish & kitty. i'd like to see that fight go down. sarahj - Those flowers look great! greenlightgo - I absolutely love the cat vs fish design. Really original and cool. I love the boxing fishy! I've been catching up on everyone's towels. AWESOME! Jq – the jeep looks great! Working on Pearliepie's towel next! My last towel! So much awesome stitching in this gallery! So happy to see finished towels!